1.1. The playing field shall be 120 yards long, with a width of 53 1/3 yards. 1.2. The four intersections of Goal Lines and Sidelines must be marked at inside corners of the End Zone and the Goal Line by pylons. Pylons must be placed at inside edges of white lines and should not touch the Field of Play. Pylons should also be placed at the 2 intersections of the Sidelines and the 50-yard Line, as well as the four intersections of Sidelines and 25-yard Lines. 1.3. All lines must be marked with a material that is not harmful to a person’s eyes or skin, and should be four inches wide, except for the Goal Lines, which should be eight inches wide. 1.4. All benches and other rigid features must be 10 yards or further back from the Out of Bounds line. If space permits these features may be placed further back. 1.5. The playing surface shall consist of grass or artificial turf. 1.6. The field will be as represented in Figure 1. 1.7. All markings or decorations on the field must not hinder the Players in any way. 1.8. On a field that is already marked with traditional tackle football markings, there are no additional markings required, simply place the pylons at the 25 & 50-yard lines. 2.1. Prior to the start time of the game, each team will send one player to the 20-yard Line for a longest throw contest where the player who throws the ball to the farthest yard line on a fly wins. The team that wins the contest can choose if they would like to start the game by receiving or executing a Throw-Off. The team that receives the First Half Throw-Off will Throw-Off to start the Second Half. The team that loses the contest chooses which Goal Line they would like to defend on the initial Possession. After each Touchdown and Safety, the teams will change direction. The Second Half Throw-Off will be in the opposite direction as the First Half Throw-Off. 3.1. Prior to the Throw-Off, the Receiving team can line up in any formation so long as none of their players are across Midfield before the ball is thrown. With the exception of the Thrower, the Throwing Team is not permitted to run up as the ball is thrown and must keep one foot on the 35-yard Line until the ball is released. The Throw-Off will occur at the beginning of the 1st and 2rd Halves and after any Touchdown or Safety. 3.2. A player from the Throwing Team will initiate a Throw-Off by throwing the ball from behind his team’s 35-yard Line. The Game Clock will be re-started, if necessary, when the ball is released by the Throwing Team. 3.3. The Receiving Team, either by catching the ball in the air or picking it up off of the ground, may advance any Throw-Off. If the ball is caught by the Receiving Team and the Receiving Player elects to place a knee on the ground in the Receiving Team’s End Zone or the ball bounces from the End Zone beyond any Sideline or the End Line, the Receiving Team will start with a First Down at its own 25-yard Line, and must cross the 50-yard Line to receive a new Set of Downs. If the Receiving Team fails to pass their own 25-yard Line, then they will not receive a new Set of Downs unless they are able to pass Midfield. This remains even after a penalty that results in an automatic First Down or Free Down. 3.4. If the Throw-Off initially hits the ground before the Receiving Team’s Goal Line, the ball may either be picked up and returned by the Receiving Team or downed by the Throwing Team. Once downed by the Throwing Team, the result is a Dead Ball with the ball spotted where it was first touched. If the Receiving Team touches the ball but fails to catch the ball on a fly or bounce, the ball will be spotted where it first made contact with the Receiving Team. If the Receiving Team, drops the ball in the End Zone, the result of the play will be a Touchback. 3.5. In lieu of a Throw-Off, the Throwing Team has the option to elect an optional play, called an Onside Play. An Onside Play is directly equivalent to a Fourth Down play for the Offensive Team and would start at the Throwing Team’s 30-yard Line. If they are able to advance the ball past Midfield, the Throwing Team would start a new Set of Downs with the ball spotted where the Onside Play ended. If not, the Receiving Team starts a new Set of Downs wherever they are able to stop the Throwing Team, in identical fashion to what would happen on a Fourth Down play. In the First Half, if the Game Clock stopped with under one minute, it will begin at the start of this play. In the Second-Half, during Controlled Time, this is an untimed play and the Game Clock will begin at the start of the next play from scrimmage. 3.6. If a team surrenders a Safety, the teams switch sides of the field and the team that surrendered the Safety must execute a Throw-Off from the 35-yard line on the opposite side of the field from where the Safety occurred. 4.1. The Offense will have one Set of Downs to advance the ball from one Box to the next. Once the Offense advances the ball from one Box into the next, they will receive a new Set of Downs. 4.2. On plays that end in between the Hash Marks, the ball will be spotted where the play ends. If a play ends outside the Hash Marks, the ball will be spotted in-line with the nearest Hash Mark. If the field does not have hash marks, the ball will be spotted in the center of the Field of Play. 4.3. The Quarterback has a maximum of 4 seconds to release the ball either by executing a forward pass, handoff or pitch on any given play. Failure to do so will result in a Dead Ball at the spot where the play ended. 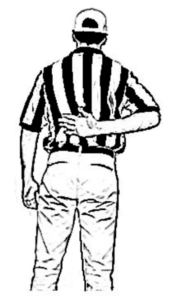 The Referee will blow the whistle to signal the end of the play, and the result will be treated as the equivalent of a sack. If at any point the Defense crosses the Line of Scrimmage, this rule will no longer apply and the Offense will have unlimited time to cross the Line of Scrimmage. 4.4. Under no circumstance is the Quarterback allowed to advance past the Line of Scrimmage without another Offensive player having Possession first, unless the Defense crosses the Line of Scrimmage. 4.5. The Defense is only allowed to cross the Line of Scrimmage by executing a Blitz, waiting for the Go-Clock to count up 2 seconds or if the Go-Clock is turned off due to a running play or Lateral. 4.6. Teams are only allowed to Punt on Fourth Down if they are in their Own Territory and have not passed Midfield on its current Possession. The team that is Punting must announce their intentions to the Referee before the Ready for Play whistle and must give the defense at least 5 seconds to set up its formation. A Punt is thrown in the air and will have the same treatment under the rules as a Throw-Off, as referred to in Section 3, with the Line of Scrimmage acting as the 35-yard line and the Receiving Team lining up a minimum of 15 yards from the Line of Scrimmage. Offensive Teams possessing the ball across the 50-yard Line are not permitted to Punt on Fourth Down. Unlike a Throw-Off, the Receiving Team on a Punt can earn a First Down by crossing their own 25-yard line if the Possession starts before that yard line. 4.7. One Lateral per team per play is allowed. On Throw-Offs and Punt Returns two Laterals are allowed on the Receiving Team’s return only. Handoffs behind the Line of Scrimmage that occur after a Snap from the Quarterback to another player are not considered Laterals for the purpose of this rule, but all other Handoffs and all Pitches are. Forward passes are permitted after Handoffs, Pitches and Laterals as long as the ball has not crossed the Line of Scrimmage. 4.8. Only 7 players are allowed in both Defensive and Offensive huddles. Too many players in the huddle will result in the same penalty, Too Many Men on the Field, explained below. 5.1. Only a Player’s front flag must cross the Goal Line in order to score a Touchdown after the Player retains possession of the ball. Prior to possession, a Player landing in the End Zone must place both feet or another body part other than hands completely inside the field of play. 5.2. A Touchdown will earn 6 points if scored from 50 yards or less and 7 points from beyond 50 yards. 5.3. After a Touchdown is scored, the scoring team will have the opportunity to earn extra points via a Conversion. Conversions attempted from the 5-yard Line will receive 1 point, from the 10-yard Line 2 points, and from the 20-yard Line 3 points. The ball will be spotted at the center of the field for all Conversions. 5.4. On the Conversion, if the Defense intercepts the ball and returns it to the Opposing End Zone, they will be awarded 2 points. Any Blitz by the Defense will count as one of its five blitzes for the Half. 5.5. On Conversions, any penalty on the Offense will result in a failed Conversion. If the Defense commits a penalty during a failed Conversion, the Conversion will be replayed with the ball spotted at the next closest Conversion spot while keeping the same point value. If the Defense commits a penalty on a Conversion that starts at the 5-yard Line, the Conversion will be ruled successful. For example, a Defensive penalty on a 3-point Conversion will result in a replay of the 3-point Conversion from the 10-yard Line. The next Defensive penalty would result in a 3-point Conversion from the 5-yard Line and a subsequent Defensive penalty would result in 3 points awarded to the Offense. 5.6. Tackling a Free Runner during a conversion results in an automatically successful attempt. If this occurs on a Defensive return, the Defense is awarded 2 pts no matter where the Conversion began. 5.7. A Safety will earn 2 points for the Defense if they pull an Offensive Player’s flag in his own End Zone while the Offensive Player has possession of the ball or if a Quarterback commits Intentional Grounding in the End Zone. Flag Guarding in the End Zone also results in a Safety. 6.1. Each game will be 60 minutes in duration, consisting of 2 30-minute Halves, with the Game Clock stopping only for Team and Referee Time Outs. Periods where the Game Clock does not stop, will be considered Running Time. If the score of the game is tied after 2 Halves, Overtime will be played. During Overtime, Team Time Outs are not allowed. The Game Clock will be turned off and each Team will have one possession to score from their Opponent’s 25-yard Line including executing a Conversion if a Touchdown is scored. The team that won the initial longest throw contest will get to choose the order of Possession. This choice will alternate after each Overtime period. Both Teams will defend the End Zone that was the target of the Game’s initial Throw-Off. 6.2.In Overtime, without exceptions including injuries, only 8 players are eligible to play no matter how many Overtime periods take place and there are no substitutions once a Possession starts. Each team will receive 1 Blitz per Overtime period. 6.3. The team leading at the conclusion of Overtime wins the game. If the score is tied at the end of an Overtime period, another Overtime period will be played until there is a winner. 6.4. Running Time will be suspended in the last 2 minutes of the Second Half. This period is the Controlled Time period. The Game Clock will also stop after any scoring play or penalty that occurs with 1 minute or less remaining in the first half or if the Game Clock runs down to 1 minute after a scoring play or penalty and will remained stopped during a Conversion. It will restart on the subsequent Throw-Off or Snap. The Game Clock will not stop for a 1-minute warning in the First Half but will stop for a 2-minute warning in the Second Half. If a Penalty is declined during Controlled Time, the Game Clock will restart on the Ready for Play whistle. 6.6. Referee Time Outs will last 1 or 5 minutes. Time Outs for change of possession will last 1 minute. Time Outs between halves will last 5 minutes. Time Outs called by either team, or at the Referee’s discretion, will last 1 minute, unless the Referee chooses to extend that Time Out. 6.7. Injury Time Outs will last a minimum of 1 minute and will be called by the Referee if he perceives that a player requires medical assistance. During Running Time, an injured player must leave the Field of Play or his team forfeits one of their Time Outs. During Controlled Time or with less than one-minute remaining in the First Half, the injured player’s team will automatically forfeit a Time Out unless the injury was the result of an act that resulted in a penalty to the other team. In Controlled Time, if the team of the injured has no timeouts remaining the opposing team has the option to run the Game Clock 10 seconds and the Game Clock will restart on the Ready for Play Whistle. 6.8. Each team will get 3 Time Outs per half. Time Outs not called in the First Half will not carry over to the Second Half. Time Outs must be called by a player on the field. 6.9. A Team cannot call 2 Time Outs prior to a play. However, each team may call 1 Time Out prior to the same play. 6.10. During Running Time, the Game Clock will stop at the beginning of all Referee Time Outs and resume when the Referee restarts the Play Clock. 6.11. The Play Clock will start when the Referee sounds the Ready for Play whistle and the Offense will have 25 seconds to start a new play. Failure to start a new play in the allotted time will result in a penalty for Delay of Game, resulting in Loss of Down. 6.12. During controlled time, any penalty committed that stops the clock will be subject to a 10-second run off, at the option of the non-offending team. If the 10-second run off is accepted, the game clock will start on the Referee’s ready for play whistle. If Game Clock was stopped at the time of the penalty, there is no run off and the Game Clock will start at the ready for play whistle. If there is less than 10 seconds remaining on the Game Clock and a run off occurs, the game will be over. 7.1. A catch or Interception is ruled complete as soon as a Player has control of the ball and two feet touch completely inbounds, although both feet do not necessarily have to touch at the same time. If another part of a Player’s body hits the ground before his feet, not including hands, then the initial contact with the ground from that body part must be completely inbounds. For avoidance of doubt, as soon as Player is ruled Out of Bounds, the play is over and a catch or Interception shall be ruled complete if the above requirements are met. 7.2. If a Player Fumbles the ball, with or without the influence of the opposing team, he is considered to have had his flag pulled, and the play is dead at the spot where the ball hit the ground. Fumbles cannot be advanced forward. Laterals can be intercepted and returned provided the ball does not hit the ground. 7.3. Interceptions may be returned and scoring rules are the same as in Section 5. For purposes of a 7-point Touchdown, the length of the return begins from where the ball is Intercepted and not the original Line of Scrimmage. 7.4. Each team will consist of a roster of 12 Players, with a maximum of 7 Players on the field during any play. 7.5. The Offense is required to have at least 3 Players on the Line of Scrimmage including the Center before the ball is Snapped. In addition, a maximum of 3 players can line up at or near the Line of Scrimmage on either side of the Center when the ball is snapped. 7.6. The Offense is allowed to have 1 Player in motion at any time, including when the ball is Snapped, so long as that Player is moving horizontally across the field. 7.7. The Center is not an eligible receiver, and therefore, cannot be the first offensive player to touch the ball after it leaves the Quarterback’s hands behind the Line of Scrimmage, receive a Forward Pass thrown by any Player or receive a Lateral from any player unless the Lateral is caught beyond the Line of Scrimmage. The Center may gain possession of a ball immediately after it is tipped by a Defensive Player anywhere on the field. The Quarterback cannot catch a Forward Pass unless it is completed beyond the Line of Scrimmage. 7.8. There is no required formation for the Defense. If not implicitly or explicitly stated below, all penalties can be declined by the non-offending team and the result of the play will stand. If one team commits multiple penalties on the same play and the other team commits zero, the non-offending team has the option to pick which penalty to enforce. All penalties that occur on an Interception, Throw-Off or Punt return by the Return Team will result in First Down where the return began. 8.1. BLOCKING: The initial remedy is Loss of Down and any yardage gained. If the Block occurs behind the Line of Scrimmage, this is a Spot Foul. At the Referee’s discretion, a Player committing a Block may be sent off the field, thus putting his team a Man Down for 3 plays. Blocking is defined as the act by an Offensive Player of forcing a Defensive Player to change his position on the field through physical contact initiated by the Offensive Player’s hands, arms, shoulders or head. Holding, which is defined as an Offensive Player grabbing or holding onto a Defensive Player to impede his motion, is also considered illegal Blocking. A pick set prior to possession of the ball by a Receiver, or prior to the Quarterback’s crossing the Line of Scrimmage in possession of the ball, will be treated as a Block. 8.2. CHARGING: The remedy for Charging is the same as for Blocking (Sec. 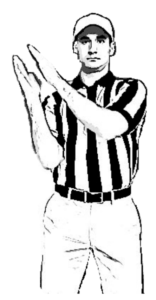 8.1), including the Referee’s discretionary ability to send a Player off the field, putting his team a Man Down for 3 plays. Charging takes place when an Offensive Player running with the ball makes significant physical contact with a Defensive Player who had established a stationary position on the field, where the Offensive Player had the opportunity to recognize that the Defensive Player has established position. Generally, an Offensive Player running with the ball has the right of way and will not be called for Charging if the Defensive Player is in motion or established his position in a manner that gave the Offensive Player no opportunity to avoid contact. 8.3. DEFENSIVE HOLDING: Defensive Holding occurs when a Defensive Player holds onto a part of the body or uniform of a ball carrier where the Offensive Player’s progress is impeded in a meaningful way. The remedy is an automatic First Down at the spot of the Foul. 8.4. 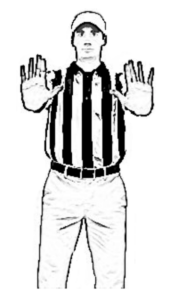 DEFENSIVE PASS INTERFERENCE (DPI):The remedy for DPI is an automatic 1st Down at the spot of the Foul. DPI occurs when bodily contact initiated by a Defensive Player prevents an Offensive Player from attempting to catch a likely catchable Pass. DPI can also occur when a Defensive Player holds onto a part of the body or uniform of an Offensive Player 5 yards or more from the Line of Scrimmage prior to a Pass being thrown where the Offensive Player’s progress is impeded in a meaningful way. Lastly, DPI also occurs when a Defensive Player forces an Offensive player out of bounds prior to a pass being thrown where the Offensive player would otherwise be deemed ineligible. For DPI penalties in the End Zone, the Offense is awarded First Down at the opposing 1-yard Line or the previous Line of Scrimmage, whichever is closer to the End Zone. A Force Out by a Defensive Player has the same remedy as DPI unless it occurs in the End Zone, in which case, the Offense will be awarded a Touchdown. If the Pass is determined to be uncatchable, no Penalty will be called. 8.5. DELAY OF GAME: The remedy for Delay of Game is Loss of Down. Delay of Game occurs if the Offense does not start a new play before the Play Clock expires. 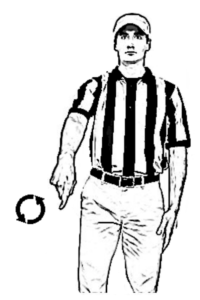 On a Throw-Off or Punt, if the Throwing Team fails to throw the ball by the time the Play Clock expires, the Receiving Team will start its Possession at Midfield if on a Throw-Off and the previous spot if on a Punt. Delay of Game also occurs if the Throwing Team on a Throw-Off or Punt throws the ball Out of Bounds on a fly or on a bounce. The Receiving Team on a Throw-Off thrown Out of Bounds gets the ball at Midfield unless the ball does not cross Midfield, in which case, the ball is spotted where it went Out of Bounds. The Receiving Team on a Punt thrown Out of Bounds gets the ball at the previous spot. 8.6. DIVING: Players may dive to pull flags or attempt to catch the ball, but they may not dive for the purpose of establishing forward progress. The Referee will determine where the player started to dive and spot the ball there. The Player who dives will be penalized and will be forced to sit out the remainder of the possession although the Offense will not be forced to play with six Players. 8.7. EARLY PULL: If a Defensive Player removes an Offensive Player’s flag before that Player possesses the ball, the Referee should say “Early Pull” and play continues. The Defense will still need to pull a flag to end the Play. 8.8. ENCROACHMENT: If any member of the Defensive Team crosses the Line of Scrimmage before the ball is snapped, the play continues and the remedy for the Offensive Team is that they may accept the result of the play or replay the Down. If the result of the play is accepted, the Defense will lose one of its Blitzes. If the play is replayed, the Defensive team will not lose one of its Blitzes. If the Defense is not Blitzing, they must wait 2 seconds to cross the Line of Scrimmage and an Encroachment penalty occurs when a team crosses the Line of Scrimmage with no remaining Blitzes before waiting 2 seconds. In all cases where the Defense has no remaining Blitzes and are penalized a Blitz, the Offense will be awarded an extra Blitz. 8.9. FALSE START: If any member of the Offensive Team crosses the Line of Scrimmage before the ball is snapped, it is a Dead Ball and the Offense is penalized with Loss of Down. This also applies to Throwing Teams crossing the Line of Scrimmage before a Throw-Off or Punt. If a False Start occurs on a Throw-Off or Punt, the Receiving Team will have the option of keeping the result of the play or getting the ball on the 50-yard Line on a Throw-Off and getting the ball at the previous spot for a Punt. 8.10. FLAG DELAY: The Defender who pulls a flag is required to immediately drop the flag on the ground or hand it to back to an Official or the Player it was pulled from. If the Defensive Player carries the flag away or throws the flag away from the Offensive Player and causes undue delay of the game, the Officials may reset the Game and Play Clocks accordingly. An Unsportsmanlike Conduct penalty may also be called on the Defense, with the appropriate remedy enforced. 8.11. FLAG-GUARDING: The remedy for Flag-Guarding is a spot foul and Loss of the NEXT Down. For example, if a Flag-Guard occurs on First Down, the next play will be Third Down. Flag-Guarding is deemed to have occurred when an Offensive Player in possession of the ball creates contact with a Defensive Player using his hands, arms, elbows or the ball to prevent a Defensive Player from pulling his flag. 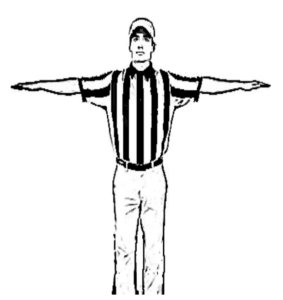 Flag-Guarding that occurs after an Interception or on a Return will result in the ball being spotted where the infraction took place and the Possession will start with Second Down. Flag-Guarding on Fourth Down will result in a Spot Foul, a turnover on downs and the following Possession will begin with a Free Down. 8.12. FLAG TAMPERING: Any attempt to tamper with Flags that would make them more difficult to pull including but not limited to using adhesives, knots and stronger magnets will result in an automatic game Disqualification and the offending team playing Man Down for the remaining duration of the game. 8.13. ILLEGAL CONTACT BY THE OFFENSE: The remedy for Illegal Contact by the Offense is Loss of Down and any yardage gained. Illegal Contact occurs when an Offensive Player, running a passing route, uses his hands, arms or shoulders to meaningfully alter the position or direction of the defender in order to gain an advantage. 8.14. ILLEGAL FORWARD PASS: The remedy for an Illegal Forward Pass is Loss of Down and any yardage gained. An Illegal Forward Pass is any Forward Pass thrown from beyond the Line of Scrimmage within five (5) yards of the Line of Scrimmage. 8.15. ILLEGAL HANDOFF: The remedy for an Illegal Handoff is Loss of Down and any yardage gained. An Illegal Handoff is any transfer of the ball from the Quarterback to another Offensive Player who is moving forward at any angle when the ball is transferred from one to the other. Pitches that travel sideways or backwards are permitted to a player moving forward, as well as handoffs to Players in horizontal motion. 8.16. ILLEGAL LATERAL: A Lateral that either goes forward or is the second Lateral on a given play ends that play. After any Illegal Lateral that travels backwards and hits the ground or is caught, the ball will be spotted where it hits the ground or is caught. An Illegal Lateral that travels forward will be spotted where the ball was released. An exception is on Throw-Offs and Punts where the Receiving Team is allowed two Laterals and this penalty will be enforced on the third Lateral. The Play will be blown dead immediately after an Illegal Lateral. 8.17. ILLEGAL MOTION: The remedy for Illegal Motion is Loss of Down. Illegal Motion is any motion by an Offensive Player behind the Line of Scrimmage that moves forward before the ball is Snapped, or more than 1 Player is in legal motion. This results in a Dead Ball and play is stopped. 8.18. ILLEGAL QUARTERBACK RUN: The remedy for an Illegal Quarterback Run is Loss of Down and any yardage gained. An Illegal Quarterback Run takes place if the Quarterback runs across the Line of Scrimmage before any Defensive Players cross the Line of Scrimmage. 8.20. INTERFERENCE WITH A THROW-OFF OR PUNT RETURN: Throwing Teams must give the Receiving Player a half-yard buffer zone to catch any Throw-Off or Punt. 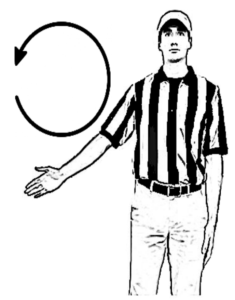 The remedy for Interfering with a Throw-Off or Punt is that the Offensive team takes Possession at the spot of the Foul or where the return ends, whichever is further, and will receive an extra Down in the next Set of Downs. The first play of the Possession will be labeled “Free Down” and the second play will be First Down. 8.21. INTENTIONAL GROUNDING: Intentional Grounding occurs when a Quarterback’s forward pass is not thrown in the vicinity of a receiver without any exceptions. The remedy will be Loss of Down and the ball will be spotted at the spot of the Foul. If this foul occurs in an End Zone, the play will result in a Safety. 8.22. MISSING FLAG: The remedy for a Missing Flag is the Player missing a flag is deemed to have had his flag pulled by a Defensive Player as soon as he is touched by a Defensive Player with any body part. A Missing Flag violation occurs when an Offensive Player begins a play without either of his two flags attached or it becomes unattached before possession of the ball but not from an Early Pull. If a Defensive Player is missing a flag, the Defense will be penalized if that Player intercepts a pass. That Player would be deemed to be down as soon as he is touched by an opposing Player. 8.23. MOVING PICK: The remedy for a Moving Pick is Loss of Down and any yardage gained. A Moving Pick violation occurs when an Offensive Player without the ball is moving when he impedes the progress of a Defensive Player in pursuit. Stationary Picks are permitted on plays from scrimmage but not on Throw-Offs or Punts. If a pick occurs during a Throw-Off or Punt, the play with be blown dead with the ball spotted where it was when the play was blown dead and the Receiving Team will start its possession on Second Down. 8.24. 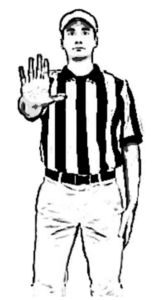 OFFENSIVE PASS INTERFERENCE (OPI):The remedy for OPI is awarding possession of the ball to the Defense at the spot of the Foul. OPI should only be called by the Referee when contact between Players is well beyond incidental and the Defender had a clear path to make an Interception. A Force Out by an Offensive Player on a Defensive Player has the same remedy as OPI. 8.25. ROLLING: An Offensive Player who Rolls on the ground for the purpose of preventing his flag from being pulled will be deemed to be down at the spot where he first commenced to Roll. Jumping and spinning are permitted evasive moves for Offensive Players. 8.26. ROUGHING THE PASSER: Roughing the Passer occurs when a Defensive Player makes contact, intentionally or not, with the throwing arm or shoulder of any Offensive Player attempting a forward pass. The remedy is an automatic first down from where the play ended and a Free Down will be awarded if the Offense gained a First Down on the play. The Referee also has discretion to send player off for 3 plays for a Man Down situation. 8.27. TACKLING A FREE RUNNER: A Free Runner has possession of the football with no defenders in front of him and would be deemed likely by the Officials to have scored in the absence of the tackle. The team whose Free Runner is Tackled will have the option to either a) have a First Down on the Opponent’s 10-yard Line or where tackled or b) be awarded 4 pts and receive a Throw-Off. If this penalty occurs during Controlled time, the Offense will be guaranteed 3 plays no matter which option it choses from either the 10-yard Line or after a Throw-Off regardless of the Game Clock unless it commits a Turnover. 8.28. TACKLING: Tackling is defined as the act of a Defensive Player disrupting an Offensive Player’s progress through physical contact initiated by the Defensive Player, such that he loses significant momentum and/or falls to the ground. At the conclusion of the play, the Offense will receive the yardage gained and a First Down. If the play ends with a loss, the ball will be spotted at the previous spot with a First Down. If a Tackle occurs on a Throw-Off or Punt, the Receiving Team will begin its Possession with a Free Down. In addition, a Player committing a tackle can be sent off the field, putting his team Man Down for 3 plays. 8.29.TOO MANY PLAYERS: If the Offense starts a play with more than 7 Players on the field, the play is dead and the Offense loses the Down. If the Defense starts a play with more than 7 Players on the field, the play continues as a Free Play, with the Offense having the option to take the result of the play or replay the Down. The remedy for a Player’s first Unsportsmanlike Conduct is the offending Player is sent off the field for 2 plays and his team plays Man Down. On a Player’s second offense he must be ejected and another player from his team who was on the field at the time of the penalty must sit out 4 plays with the team Man Down. 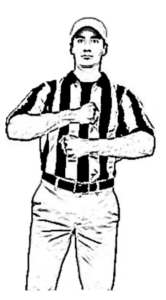 Officials at their discretion can eject a player on their first Unsportsmanlike penalty and enforce a 4-play penalty similar to a second offense. Any player ejected from a game will be ruled ineligible for the next game. 8.31. 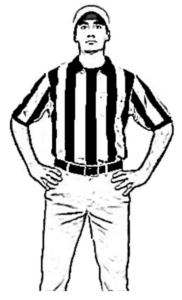 UN-TUCKED BALL CARRIER/UNALIGNED FLAGS:Prior to a Snap, whenever the Referee observes any Player with his shirt covering any part of his flags or his flags to be unaligned and not at his hips, the Referee will warn the player. 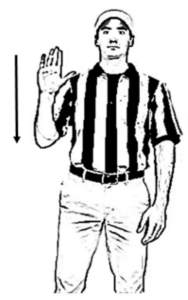 If the player does not comply prior to the play, the Referee will yell the offending player’s number and “One-hand touch.” That player shall then be deemed down as soon as a Defensive Player touches him. 9.1. All balls will be provided by the AFFL. 10.1. Each team will have 7 Players on the field. 10.2. Teams can arrive 10 min before the start of a game to warm up and need 6 players to begin a game. If a game is not started 5 minutes after it is scheduled due to insufficient players, the result of the game is an automatic forfeit. 10.3. Every team is allowed to have a maximum of 12 Players for any particular game. 10.4. Player uniforms must have numbers on the front and back of shirts. 10.5. Players must wear solid black shorts with no pockets. 10.6. All clothing worn underneath shirts and shorts must be black. 10.7. No jewelry is allowed to be worn. 10.8. Players can not wear face coverings but are allowed backwards Official AFFL baseball hats and soft protective gear with no visible logos. 11.1. All Officials will be trained and credentialed by the League. 11.2. Up to six Officials will work each game: one Referee, two Linesmen and two Field Judges, and a Timekeeper. 11.3. The Referee is the senior most Official and can overrule any of the other Officials. He will start each play 5-10 yards behind the Quarterback. Generally, the Referee should defer to the judgment of the Official who had the best view of the play in question. 11.4. The Linesmen will stand outside the Sidelines on either side of the field near the Line of Scrimmage. 1.5. The Field Judges will be stationed on the Defensive side of the Line of Scrimmage, on the sidelines in the vicinity of the furthest Defensive Player from the Line of Scrimmage. 11.6.The Timekeeper will be responsible for operating the Game, Play and Go Clocks. 11.7. 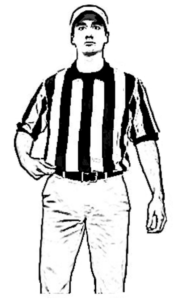 All Officials will wear uniforms provided by the League. 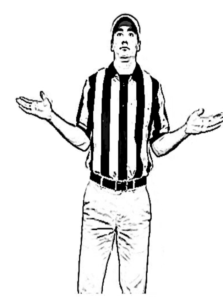 Black and white striped shirts, black hat, black pants, and black shoes for Linesmen and Field Judges. The Referee will wear a white hat. 11.8. One additional staff member will be responsible for keeping track of where the ball is spotted using a conspicuous pole placed on the sideline and can be the timekeeper. 11.9. Instant replay review of disputed calls is permitted if available. There will be a replay official responsible for reviewing each play and will let the Referee know if a play needs to be changed. Teams cannot request a play to be reviewed. 11.10. All plays are reviewable including penalties. 12.1. Ball Ready for Play – A Dead Ball is Ready for Play when the ball is placed down by an Official at the spot where the ball will next be put in play, and the Referee signals for the 25 second Play Clock to start. 12.2. Blitz – On a Blitz, the Defensive team may rush the Quarterback as soon as the ball is Snapped. All Defensive players are eligible to Blitz. There is no limit to the number of Defensive Players that can Blitz on a given play. 12.3. Boundary Lines – The Boundary Lines are the End Lines and the Sidelines and enclose the field upon which the game is played. 12.4. Box – There are 4 Boxes on the Field of Play, two on each side of Midfield. One from the Goal Line to the 25-yard Line, the other from the 25-yard Line to Midfield. 12.5. Controlled Time – Controlled Time is the period of the game where Running Time is suspended per the rules set out in Sections 6.3 and 6.4. 12.6. Conversion – A Conversion is a play that takes place after a Touchdown. The rules for Conversions are set out in Sections 5.3 to 5.5. 12.7. Dead Ball – A Dead Ball is one that is not in play, where the runner is declared down or a pass is declared Incomplete. 12.8. Defense – The team that starts the Down without the ball is the Defense. 12.9. Disqualified Player – A Disqualified Player is one who is prohibited from further participation in the game. He must return to his dressing room within a reasonable period of time and is not permitted to reappear in his team uniform or return to any area other than to which spectators have access. The Referee will disqualify a Player who has received two different penalties that put his team Man Down. 12.10. Down – A Down is a period of action that starts when the ball is Snapped and ends when the ball is declared Dead. The Offensive team has four Downs, a Set of Downs, to achieve either a score or obtain a fresh Set of Downs by crossing the appropriate yard line. hieve either a score or obtain a fresh Set of Downs by crossing the appropriate yard line. 12.11. End Lines – The End Lines are the lines at each end of the field and are perpendicular to the Sidelines. 12.12. End Zone – The End Zone is the rectangle formed by the Goal Line, the End Line, and the Sidelines. The Goal Line and the pylons are in the End Zone. 12.13. Field of Play – The Field of Play is the rectangle formed by the Goal Lines and the Sidelines. 12.14. First Half – The first 30-minute period of the game. 12.15. First/Second/Third/Fourth Down – The initial Down in each Set of Downs is the First Down, the second is Second Down, etc. If the Offensive team fails to reach the Box they are required to reach after Fourth Down, the Defensive team starts a new Set of Downs at the spot where the Offensive Player was ruled down. 12.16. Force Out – A Force Out takes place when a Player attempting to catch a ball lands Out of Bounds due primarily to the influence of contact with an opposing Player. A Force Out will be considered a catch at the point where the Offensive Player left the Field of Play. 12.17. Forward Pass – A Forward Pass is a ball thrown by an Offensive Player that travels to a point that is closer to the Defensive Team’s End Zone than the Offensive Team’s End Zone. Forward passes are not permitted on returns of Throw-Offs or Punts. 12.18. Foul – A Foul is any infraction of a playing rule for which a penalty is prescribed. 12.19. Free Down – A Free Down occurs when the Receiving Team is not given an opportunity to catch the ball or is tackled on a return. It also occurs when the Defense commits a penalty whose remedy includes an automatic first down after the Offense has already gained a First Down on the play. The Free Down gives the Receiving Team a fifth opportunity to advance the ball to the next Box and is played prior to First Down. 12.20. Free Play – aA Free Play is a play where the team in possession of the ball has the option to replay the Down or accept the outcome of the play. 12.21. Free Runner – A Free Runner has possession of the football and would be deemed likely by the Officials to have scored in the absence of a tackle. 12.22. Fumble or Stripped Ball – Any time a runner, on Offense or Defense, loses possession of the ball, either on his own, or because the ball is stripped out, he will be considered down at the point where the ball hits the ground. In instances where the ball is stripped by a Defensive Player and the ball does not hit the ground, only the team in possession of the ball can recover it and continue the play. 12.23. Game Clock – The Game Clock keeps time for the entire game, in both the Running and Controlled Time segments of the game and is managed by the Time Keeper. Ideally, the Game Clock will be visible on all four sides of the field. 12.24. Go Clock –The Go Clock will start on the Snap at zero seconds (0) and count up to two seconds (02) and turn green and then count up to four seconds (04) and turn red. The Go Clock should be visible at each end of the field and should be either the same device as, or adjacent to, the Play Clock. If a Go Clock is not available, the count can be communicated verbally by an Referee. 12.25. Goal Lines – The Goal Lines are the lines between the Sidelines that separate the End Zone from the Field of Play. The Goal Lines are vertical planes that are parallel to and 10 yards from the End Lines. 12.26. Hash Mark – A Hash Mark is a mark of 4 inches x 2 feet and are used to measure each yard line. 12.27. Incomplete Pass – An Incomplete Pass is a Pass that is not caught. 12.28. Interception – A pass caught by the opposing team and returned is an Interception. The Defense must obtain complete control of the ball in order to be ruled an Interception. Complete control is determined at the discretion of the Officials. 12.29. Lateral – A Lateral is a sideways or backwards Pass from one Offensive Player to another. Laterals are permitted on all plays and points on the field, including Throw-Offs and Punts. Laterals that are dropped are treated as Fumbles. 12.30. League – The League refers in these rules to the Commissioner’s office of the American Flag Football League. 12.31. Line of Scrimmage – The Line of Scrimmage is the vertical plane of the yard line that passes through the forward point of the ball after it has been placed on the ground and made ready for play by the Officials. 12.32. Live Ball – The Ball is Live when it has been snapped from the Line of Scrimmage. The ball will remain Live until it is ruled Dead and the Down is over. 12.33. Loss of Down – Loss of Down is a remedy for a variety of penalties in Flag Football. A team that is penalized Loss of Down must start a new play with one less Down remaining in the Set of Downs. For example, a team penalized for Loss of Down on 1st Down would start the next play as 2nd Down. 12.34. Man Down – A team is Man Down when one of their Players has committed an infraction that causes the Officials to send that Player off the field for 2, 3 or 4 plays, the number of plays being based on the penalty. Sent off players must remain past any End Line and the Sideline opposite their team’s bench. No other Players may substitute for a Player who has been sent off. If a Player is ejected from the game for two Man Down penalties, another Player who was on the field at that time must serve his penalty on the second infraction. If a team is Man Down and surrenders a Touchdown, then they may resume play with a full complement of players defending the conversion. 12.36. Offense – The team that starts the Down in possession of the ball is the Offense. 12.37. Opposing Territory – The area of the field between Midfield and the End Zone toward which a team’s Offense drives. 12.38. Out of Bounds – A Player is Out of Bounds when he touches a Boundary Line, or when he touches anything that is on or outside a Boundary Line, except a Player, an Official, or a pylon. 12.39. Out of Bounds Spot – Wherever an Offensive Player with the ball exits the Field of Play will be the spot of the next Down. The spot will be established by the position of the Player’s flag that is furthest from the End Zone at the point where the runner crossed the Sideline. 12.40. Overtime – Overtime is the third period of the game that is played only if the score is tied at the end of the Second Half. The rules of Overtime are set out in Section 6. 12.41. Own Territory – The area of the field between Midfield and the End Zone away from which a team’s Offense drives. 12.42. Pass – A Pass is an act by a Player of directing the ball to a teammate in the air. 12.43. Play Clock – The Time Keeper will manage The Play Clock. Once the Officials put the ball in play and start the Play Clock, the Offensive team will have 25 seconds to snap the ball or they will be guilty of Delay of Game. Ideally, the Play Clock will be visible on both sidelines. 12.44. Possession – A Possession is defined as a period where the Offense is awarded the opportunity to complete at least one Set of Downs. 12.45. Punt – A Punt is a play where the Offense throws the ball on Fourth Down to the Defense. 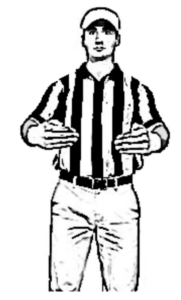 A Punt must be declared in advance of the play to the Referee by the Offense. The rules associated with a Punt are set out in Section 4.6. 12.46. Quarterback – The Quarterback is the Offensive Player who first touches the ball after the Center’s Snap. 12.47. Receiving – The Receiving Team position themselves on their own side of Midfield until the Throwing Team initiates the Throw-Off. 12.48. Running Times – Running Time is the period of the game where the clock stops only on Time Outs. The rules of Running Time are set out in Section 6. 12.49. Second Half : The second 30-minute period of the Game. 12.51. Sidelines – The Sidelines are the lines on each side of the field and are perpendicular to the End Lines. The Sidelines separate the Field of Play from the area that is Out of Bounds. 12.52. Simultaneous Possession – Simultaneous Possession occurs when a Forward Pass is caught by Offensive and Defensive Players at exactly the same time. 12.53. Snap – The Snap is the act of removing the ball from the ground and delivering it to another Player on the Offensive team. The Snap must go through the legs of the Offensive Player delivering the ball. 12.54. Stationary Pick – A Stationary Pick is permissible only on plays from scrimmage and not during Throw-Offs or Punts. A Pick is the act by a Player of using his body position to impede the progress of a defense Player without using his hands or arms. For a Pick to be legal, the Offensive Player must clearly establish his position before he makes contact with a Defensive Player. Picks may only be set after a Player has possession of the ball. 12.55. Throw-Off – The Throw-Off rules are in Section 3 of the Rules. The Throw Off will start play at the beginning of each half and after each Conversion attempt. 12.56. Throwing – The Throwing Team throws the Ball to the Receiving team. The Player who is throwing the ball must throw the ball before he reaches his own 35-yard Line or Line of Scrimmage. His teammates on the Throwing team must be touching the 35-yard Line or Line of Scrimmage when the Quarterback releases the ball. 12.57. Touchdown – A Touchdown is a scoring play. The scoring team receives 6 points for a Touchdown where the Down started in Opposing Territory and 7 points when the play started in their Own Territory. Forward progress for the purpose of determining a Touchdown is determined by the position of the front flag of the Player in control of the ball attempting to enter the End Zone. In addition, a receiver must have both feet down inside the Field of Play with control of the football to score a Touchdown. 13.1. Each Defensive Team can Blitz 5 times in each Half. 13.2. The Go Clock is turned off as soon as a Defensive Player passes the Line of Scrimmage or as soon as the Quarterback releases the ball either forward or backwards. 13.3. Players who fall to the ground may get up and continue to run. However, when on the ground, a player in possession of the ball is considered down when contacted by a defender with any part of the defender’s body. 13.4. Loss of Down penalties imposed on the Offense on Fourth Down result in change of possession at the previous Line of Scrimmage. 13.5. If penalties are called on both Teams during any play, the result is a replay of the Down or Throw-Off even if the penalties differ in severity. 13.6. Any penalty committed by the Defense which would normally result in an automatic First Down that occurs after the Offense has gained a First Down on the play will result in a Free Down awarded to the Offense. For avoidance of doubt, DPI or similar penalties, by definition, occur before the Offense gains a First Down and are not applicable to this paragraph. 13.7. After an inadvertent whistle by the Referee, the Offense has the option of replaying the down or keeping the progress made on the play at the point when the whistle was sounded. 13.8. All Offensive Players are eligible receivers with the exception of the Center. 13.9. Forward progress is measured by the position of a Player’s front flag when either flag is pulled. 13.10. Simultaneous Possession of a Forward Pass will be ruled to be a catch for the Offense. 13.11. Defensive Players can initiate contact with an Offensive Player within 5 yards of the Line of Scrimmage so long as the contact is not sustained by the Defensive Player by grabbing or holding onto the Offensive Player. 13.12. Games cannot end on a Defensive penalty. In the event of a Defensive penalty on a play where time runs out, the Offense will be awarded one more play, with the Play Clock in motion, but the Game Clock not in use. 13.13. 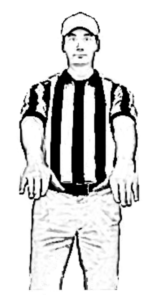 Prior to a snap, Referees can require and warn players to adjust their flags to their proper alignment. Repeated warnings of this nature can result in an Unsportsmanlike penalty. 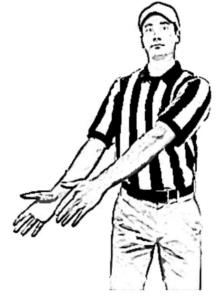 1 BLOCKING One arm extended in front of chest, hand open, grasped at wrist by other hand. 2 CHARGING Two arms extended in front of chest, closed fists with thumbs on top. 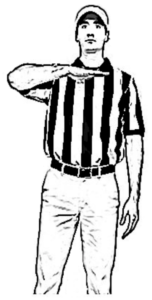 3 DELAY OF GAME or FLAG DELAY Folded arms. 4 DIVING Arms extended tilted slightly towards ground, palms facing downward. 5 ENCROACHMENT Hands on hips. 6 FALSE START Forearms rotated over each other. 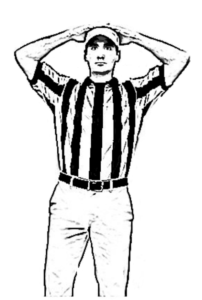 7 FLAG GUARDING One arm raised, palm open, motioned down towards hip. 8 ILLEGAL CONTACT OFFENSE One open hand extended forward. 9 ILLEGAL FORWARD PASS One hand place behind the back. 10 ILLEGAL HANDOFF One arm out to the side, open hand, thumb pointing upwards. 11 ILLEGAL LATERAL Both arms extended towards ground on one side of body. 12 ILLEGAL MOTION or ILLEGAL QUARTERBACK RUN One hand brought to top of chest, hand open, palm facing down. 13 INTENTIONAL GROUNDING Parallel arms waived diagonally across body. 14 MISSING FLAG Arms out to sides, elbows connected to body, shrugging shoulders. 15 MOVING PICK or DEFENSIVE HOLDING One clenched fist in front of the chest, grabbed by the other hand. 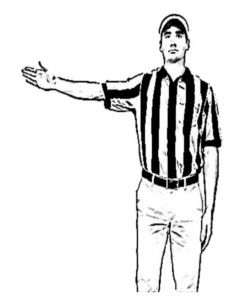 16 PASS INTERFERENCE or INTERFERENCE With a THROW-OFF or PUNT Both arms extended in front of shoulders, hands open. 17 ROLLING One arm extended with one finger pointed at the ground, circular motion with finger. 18 RUN CLOCK Full circle made with one arm. 19 TACKLING or TACKLING A FREE RUNNER Hugging motion simulated with both arms in front of body. 20 TIME OUT Forearms crossed above the head, palms facing forward. 21 TOO MANY PLAYERS Both hands on top of head. 22 UN-TUCKED BALL CARRIER Pull on shirt near belt with one hand. 23 UNSPORTSMANLIKE CONDUCT Arms outstretched, palms down. © 2019 American Flag Football League. AFFL and Logo are registered trademarks of the American Flag Football League.The team names, logos and uniform designs are registered trademarks of the teams indicated.